FILE - U.S.-based Turkish cleric Fethullah Gulen at his home in Saylorsburg, Pa., July 10, 2017. Turkey's foreign minister says U.S. President Donald Trump recently assured Turkish President Recep Tayyip Erdogan that Washington is considering extraditing a Muslim cleric that Ankara accuses of orchestrating a failed 2016 military coup. 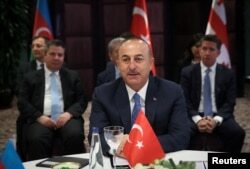 Turkish Foreign Minister Mevlut Cavusoglu told the U.S. television network CNBC that when Trump and Erdogan recently met at the G-20 summit in Argentina, the American leader said the United States is "working on extraditing" Fethullah Gulen "and other people." 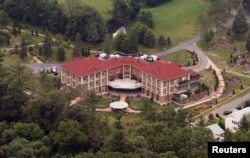 FILE - An aerial view shows Turkish-born Muslim cleric Fethullah Gulen's worship and retreat Center in rural Saylorsburg, Pennsylvania, July 9, 2013. The 77-year-old Gulen, a one-time ally of Erdogan, has lived in self-imposed exile in the eastern U.S. state of Pennsylvania for nearly two decades, but Washington has resisted Erdogan's demand he be returned to his homeland to face charges that he directed the coup attempt from across the Atlantic. In the failed attempt to oust Erdogan, soldiers in tanks and helicopters attacked the Turkish parliament and shot at unarmed civilians. About 300 people were killed in the fighting, but troops loyal to Erdogan prevailed. FILE - Turkish soldiers accused of attempting to assassinate President Tayyip Erdogan on the night of the failed July 15 coup, are escorted by gendarmes as they arrive at the court in Mugla, Turkey, March 8, 2017. Erdogan subsequently ordered the arrest of thousands of people, including academics, journalists and government workers, that he believed were supportive of the attempted putsch. In the two years since the aborted coup, 77,000 people have been arrested and more than 160,000 fired from their jobs. The United States, including under former President Barack Obama, has said information Turkey has handed it supporting Ankara's claim Gulen orchestrated the coup has not been sufficient to extradite him. Cavusoglu told a conference in Doha, "I have recently seen a credible probe by the FBI on how the Gulen organization avoids taxes," referring to the top U.S. law enforcement agency, the Federal Bureau of Investigation. Gulen has often denied involvement in the failed coup. Erdogan said last week the government would make new efforts to target the financing of Gulen's supporters.